Our present pastor is the Reverend David E. Green. Fr. Green was born on February 12, 1957 in Providence, R.I. to Donald E. Green, Sr. and Helen E. (Laclair) Green. Fr. Green was baptized on March 3, 1957 at Sacred Heart Church East Providence, R.I. by Rev. Joseph A. Devanney. He also received his First Communion at Sacred Heart on May, 1964 and made his Confirmation in May of 1973. He thereupon pursued his secondary education at Our Lady of Providence Preparatory Seminary High School in Providence, R.I. and graduated from there on June 8, 1975. He then attended Rhode Island College and began to pursue studies for a career as an elementary school teacher but only lasted two semesters when he felt a calling to the priesthood. In order to pursue this vocation Fr. Green applied to Our Lady of Providence Seminary, Warwick, RI, where he was accepted and entered in September of 1978. Father graduated from Rhode Island College with an M.A. in Social Sciences on May 22, 1982. One year later he entered St. John Seminary, Brighton, MA. Father completed his studies for the Priesthood of the Diocese of Providence after having received a Master of Divinity from St. John Seminary in December 1987. Shortly after completing his studies Father was ordained a Transitory Deacon on January 16, 1988 at the Cathedral of Ss. Peter and Paul in Providence, RI by the Most Reverend Kenneth A. Angell, Auxiliary Bishop of Providence. His ten month Deacon Assignment was to St. Philip Church, Greenville, RI. Upon completion of the deaconate program Fr. Green was ordained to the Priesthood on November 19, 1988, Cathedral of Ss. Peter and Paul, Providence, RI by Most Reverend Louis E. Gelineau, Bishop of Providence. He was 33 years of age at the time. Since his ordination Father has had several assignments, first as assistant pastor and then as pastor. His first assignment was to be Assistant Pastor at St. Peter Church, Warwick, RI. He held that position from November 1988 – June 1990 when he was assigned to be Assistant Pastor at St. Elizabeth Church, Bristol, RI which lasted from June, 1990 – June, 1995. Fr. fulfilled his final duties as an Assistant Pastor at St. Timothy Church, Warwick, RI, serving from October, 1995 – June 2001. His pastorate assignments include the following parishes. Pastor, St. Martha Church, East Providence, RI July 2011 – Present. 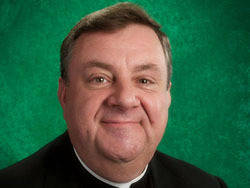 Father is now in his 25th year of priestly life and service to the people of the Diocese of Providence.